Robert Lansing served as Secretary of State from June 24, 1915, until February 13, 1920. Lansing’s background in international law afforded him a wealth of foreign relations experience, which influenced his tenure at the Department of State. His most important achievements included his oversight of U.S. foreign policy during the First World War and his negotiation of a major agreement between the United States and Japan. Born in Watertown, New York, on October 17, 1864, Lansing graduated from Amherst College in 1886 and began practicing law in 1889. In 1890 he married Eleanor Foster, Secretary of State John Watson Foster’s daughter. Lansing was uncle to both Secretary of State John Foster Dulles and Director of the Central Intelligence Agency Allen Welsh Dulles. He worked for the Lansing & Lansing law firm in Watertown until 1907. During his tenure there, he became an authority on international law and represented the United States Government in many international hearings. He served as Associate Counsel for the United States in the Bering Sea Arbitration (1892-1893), Counsel for the United States Bering Sea Claims Commission (1896-97), Solicitor for the U.S. Government before the Alaskan Boundary Tribunal (1903), Counsel for the North Atlantic Fisheries in the Arbitration at The Hague (1909-10), and as Agent of the United States in the American and British Claims Arbitration (1912). Lansing was also instrumental in founding the American Society of International Law in 1906, and in establishing the American Journal of International Law in 1907. He became Counselor of the Department of State in 1914 and served as ad interim Secretary of State in the Woodrow Wilson administration from June 9, 1915, until his appointment as Secretary of State on June 24, 1915. After leaving the Department of State, Lansing continued working in the field of international law in the Washington, D.C. area until his death on October 30, 1928. Lansing’s influence on U.S. diplomacy extended beyond his tenure as Secretary of State due to the important role he played in helping to settle a number of high-profile international disputes. This influence only grew once Lansing became Secretary. While Secretary he was faced with the significant foreign policy challenges related to the U.S. position in the First World War. Initially, Lansing advocated benevolent neutrality in the European conflict and strongly protested British blockades and contraband practices, while advocating for the principles of the freedom of the seas and the rights of neutral nations. 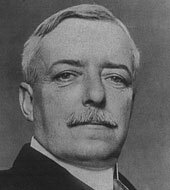 Lansing eventually came to favor U.S. participation in the war and accompanied President Woodrow Wilson to Europe as one of the lead U.S. negotiators at the Paris Peace Conference in 1919. As Secretary of State, Lansing also signed the Treaty of 1916 for the purchase of the Danish West Indies and the Lansing-Ishii Agreement of 1917 with Japan--a pledge between the United States and Japan to uphold the Open Door Policy in China, while recognizing that Japan had special interests in China. Lansing is also credited with establishing the Diplomatic Security Service, having hired the Department of State’s first special agents, who were assigned to observe Central Power activities in the United States before and during the First World War. Due to disagreements over the League of Nations and President Wilson’s inability to perform his presidential duties following a stroke, Lansing resigned on February 13, 1920. Commissioned as Counselor for the Department of State. Commissioned during a recess of the Senate; recommissioned after confirmation on Dec 13, 1915.